BIKETOWN for All offers discounted BIKETOWN memberships to Portlanders living on low incomes. The program is a partnership between the Community Cycling Center (CCC), the Portland Bureau of Transportation, Motivate, Portland Parks and Recreation, and participating affordable housing communities, social service agencies and local nonprofits. Portlanders whose incomes qualify them for an Oregon Trail Card (EBT card) can sign up to receive a discounted membership for only $3 per month. As part of the program, we also provide bike safety education and free bike helmets. Are you a representative of a housing provider, social service agencies or local nonprofit interested in joining as a referring organization? 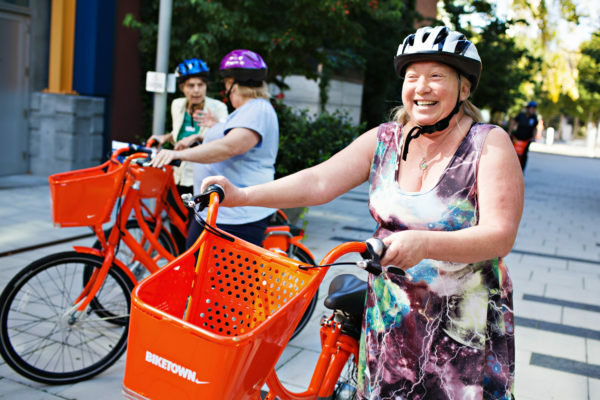 Or are you an individual interested in learning how to become a BIKETOWN for All member? Please fill out the BIKETOWN for All Interest Form. Do you have more questions about the program? Our Frequently Asked Questions page might have your answers.